1. Heat the oil in a stir-fry pan, deep skillet or pot, and fry the onion & garlic over medium heat until the onion softens and starts to turn light brown. 2. Add the beef, stir in the crushed and whole peppercorns, ground oregano and stir fry the mixture until the beef is cooked. 3. Add the mushrooms and stir fry until they are softened. 4. Stir in the pre-made pasta sauce (I usually use Prego 100% Natural Traditional Italian Sauce), the capsicums and the tomatoes (if any), bring to a boil and simmer for 15 minutes. 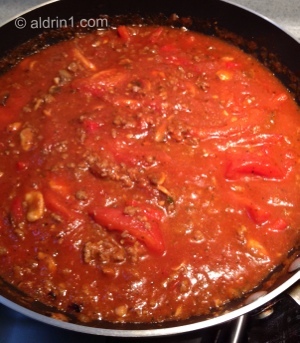 Add additional water if the sauce gets too dry or thick for your taste. 5. Season with salt and pepper to taste and serve the sauce hot with your choice of pasta, either tossed with the pasta or the pasta topped with the sauce. Top with grated Parmesan cheese if desired. 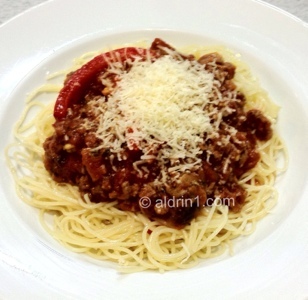 This recipe makes something like a peppery sauce for spaghetti bolognese with the ground beef. But you can use whatever ingredients you feel like using to liven up jars of pre-made pasta sauces: portobello mushrooms, ground chicken, a bay leave or two for extra flavor, shrimp, zucchini, etc … just use your culinary imagination to make more memorable sauces from jars of pre-made pasta sauces! What are your favorite ingredients that you like to add to your pasta sauces? I really want to try this out! It looks/sounds super tasty. I might leave out the beef for my vegetarian friends! Hi, Forsarap! Thanks for reading and do let me know how it turns out for you, ok?